Pai Gow Poker is a card game played with a 53-card deck consisting of a standard deck of 52 cards plus one Joker. 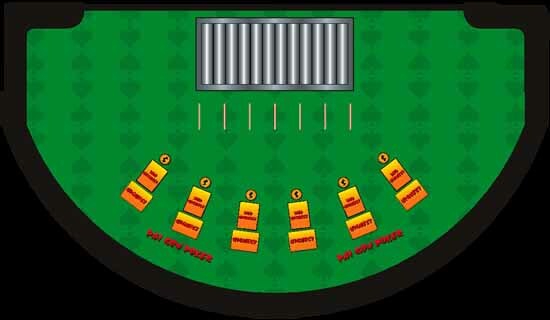 The player receives seven cards, which must then be "set" two hands are compared with the dealer's two hands to determine the winner. The 5-card hand must rank higher than the 2-card hand. Cards are ranked according to standard poker rules (see chart below). Joker can only be used to complete straights or flushes, otherwise it counts as an Ace. Dealer wins any copied hand. Both the 5-card and the 2-card poker hand outrank the dealer's hand. Both the 5-card and the 2-card poker hand are outranked by the dealer's hand. The dealer outranks either of the two hands and the other hand is a copy. The player wins one hand and the dealer wins the other. The hands are ranked according to standard poker rules with one exception: the Ace-2-3-4-5 straight is the second highest straight. Straights rank, from highest to lowest: Ace-K-Q-J-10, Ace-2-3-4-5, K-Q-J-10-9, 6-5-4-3-2. Also, keep in mind that the best two-card hand is a pair of aces; the two-card hand cannot have a flush (since a flush requires five cards).